You might think that this pitcher looks a bit like crushed ice, and perhaps the illusion is intended. 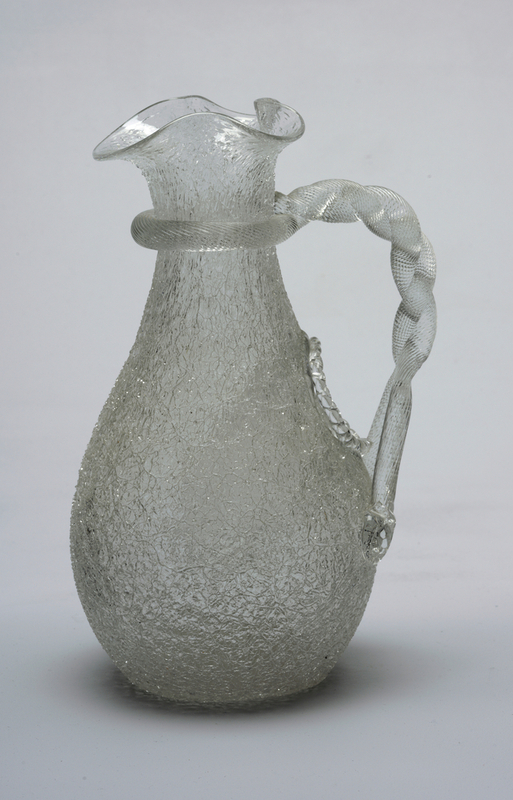 This isn’t just any old pitcher, but a champagne pitcher, and it is special because of its so-called “bladder.” Within the body of the vessel, underneath the handle, is a cavity in which ice can be inserted, to keep your bubbly cold but not dilute it. To create this vessel, after blowing the form, the glassworker would have rolled it in glass shards, producing the effect known as “ice-glass”, or “overshot glass”. Another way to get a similar effect is to plunge a blown glass form, while it is still hot, into a bucket of water. It is possible that both methods were employed in the making of this pitcher. The resulting material, called craquelle, or crackle, glass has a distinct texture reminiscent of the tiny fissures in melting ice. This pitcher was manufactured by the Boston and Sandwich Glass Company, an important nineteenth-century American glass manufactory in Sandwich, Massachusetts. The company is particularly known for its pressed glass objects and innovative use of color.